Our 44th show was a success and thoroughly enjoyed by the participants, despite the miserable weather. Shows in KZN all seem to be shrinking and this show was no exception. 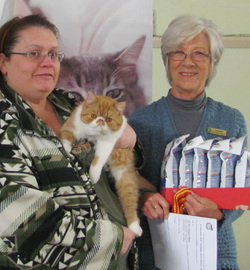 Sadly there was not a single longhair cat present on the day and only one entered in the catalogue. If anyone has ideas on how we can stem the tide and get these beautiful cats back on the show bench, please let us know. The Dalmein Shellhole in Escombe, a typical Moth Hall, is easy to find and quite adequate for the small shows in KZN and we would most likely use this venue again, as it fits well into the budget. 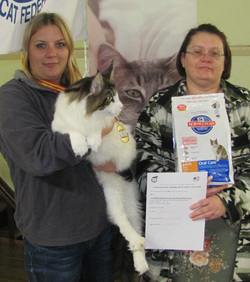 We were privileged to have two new judges at our show, apart from the "regulars". 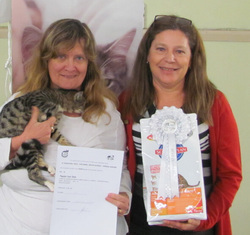 Sheila Hansen, SACC SOSH & LH judge did a sterling job and fitted right into the system. 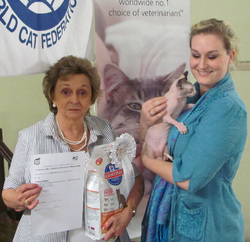 Anthony Aldum, from Cape Town did a sterling job in the shorthair category and was a great help during the Best in Show. Hills gave us incredible prize sponsorship, as in the past and nobody went home empty-handed, as all the exhibitors and judges received a gift. Thank you to the local "banana bunch", who once again did the hard work quietly in the background and ensured that everything was in place to make this an enjoyable and successful day.